I know it has been a long time since I have written. I made a fantastic deal with the Easterners to bring back some high quality saffron, and they decided to include tomatoes. I have heard tell of a new sauce the Far East called ke-tsiep. It will go quite splendidly as a dipping sauce for chips. I think it will sell quite well. 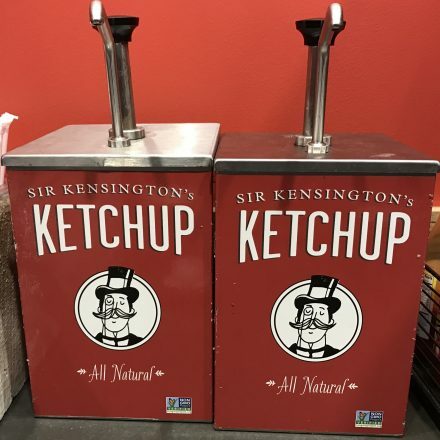 I shall call it Sir Kensington’s Ketchup. When we made it to America, we had a few days of rest. I decided to go exploring and order a common burger at a tavern B. Good. I know, I was shocked as well. I even ordered the Buffalo. What is that you might say? 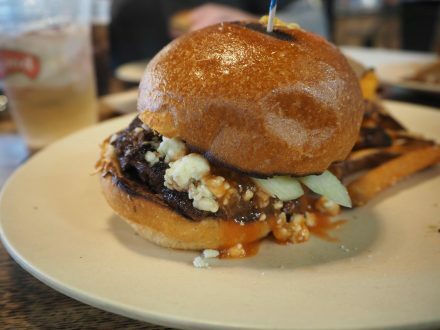 It is a spice combination from the New World that combines a tangy sauce with bleu cheese and shaved celery. I decided against the carrots. I mean, I was going out on a limb with the celery. Can you believe it? Celery. On a hamburger. The concoction was shockingly good. The mix of orange sauce absorbing into bleu cheese and the fresh crunch of the celery. All atop a perfectly medium fresh-made patty. My only quibble was the toppings were sloppily placed. If they were centered on the toasted bun, it would have achieved perfection. As a result, I give it a 4.75. I am writing you to inform you that Jolinda is no longer interested in your courting. As I have taken her to B. Good’s myself and indelibly marked her heart with their food and my intentions. In fact, so honored were they with our visit, they named the burger I ordered after myself called the Cousin Oliver. 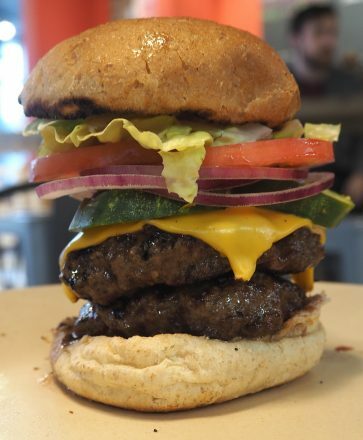 I proclaimed my love for their burger by requesting a second patty be added to the most delectable combination of lettuce, tomato, onions and Chef Tony’s homemade pickles, plus I dared to add cheese and might I add, it made all the difference. Jolinda was so overcome with feelings of joy and happiness that we had found and tasted a 5.0 together, we knew it to be a sign that our love was true. You know how very fond I am of you both, but I regret to inform you that I have had the most amazing experience which has verily made me rethink my love. The sensational new experience of this burger from B. Good has marked my soul indelibly. I will be forever in your debt, Ollie, since you introduced me to this new and remarkable provision! Please forgive me as I must correct your misunderstanding – my love and joy was for the burger, and I must be true to what my heart desires. 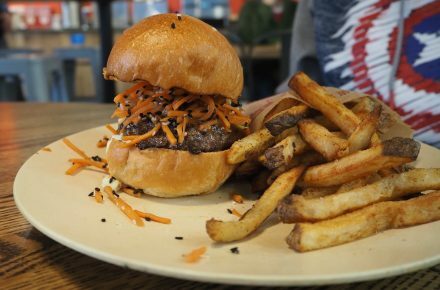 I, too, ordered a burger with a concoction from this Buffalo location. With the addition of celery, carrots, bleu cheese and a hearty bun, I was hopeful yet suspicious. Indeed, my first bite was overly full with the buffalo sauce and my heart wavered. However, each subsequent bite was better than the last and by the end, the taste buds of my mouth were flying. The meat was well seasoned and salty. The celery and the carrots were snappy, not overpowering. Each topping was well-proportioned although I do agree with you, Reggie, that the toppings were weakly structured. On the whole, however, it was divine, my darlings. Simply divine 4.75.